Having received some of the fantastic right angle nail vinyls from Picture Polish for blog fest, I was excited to create another design with them. 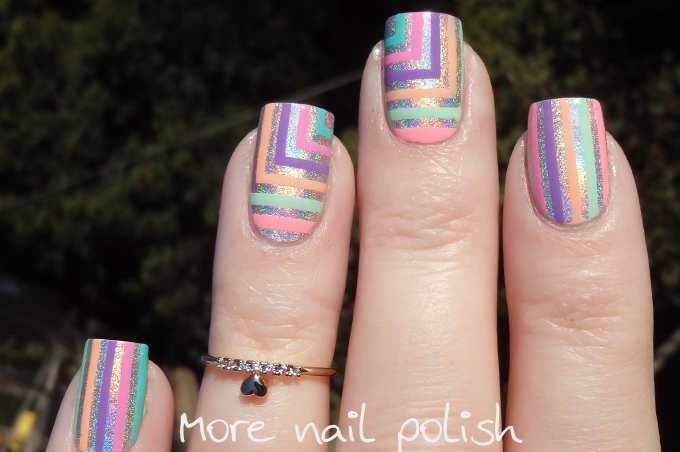 For this mani I used the second thinnest right angle vinyls and the thinnest straight vinyls. These are the nail vinyls from nailvinyls.com, which a selection is also available through Picture Polish. My base is FNUG Pshychedelic and I used all six creme polishes from last years China Glaze Sunsational collection. I did have one problem with this mani, but luckily I was able to fix it all up. The problem was, because I had the vinyls on my nails for quite a long time (because it took bloody ages to fill in each of these colours) I ended up with a sticky residue left on my nails. This really bummed me out because it meant I completely lost the holographic effect of the FNUG polish underneath. First, after waiting for my stripes to be completely dry, I tried scrubbing my nails with warm soapy water. That didn't budge the stickiness. So next I tried a little bit of eucalyptus oil on a cotton round and it was perfect. It easily removed all the sticky residue and didn't effect my nail art at all. I then washed my hands thoroughly to remove the oil so I could put a couple of layers of top coat on. Eucalyptus oil might be a bit harder for people in other countries to get, but for us Aussies you can grab huge bottles of it from the chemist. The other bonus - it smells so beautiful. I just love the smell of eucalyptus. My dots nails from 2013! Love it! The holographic polish is beautiful. 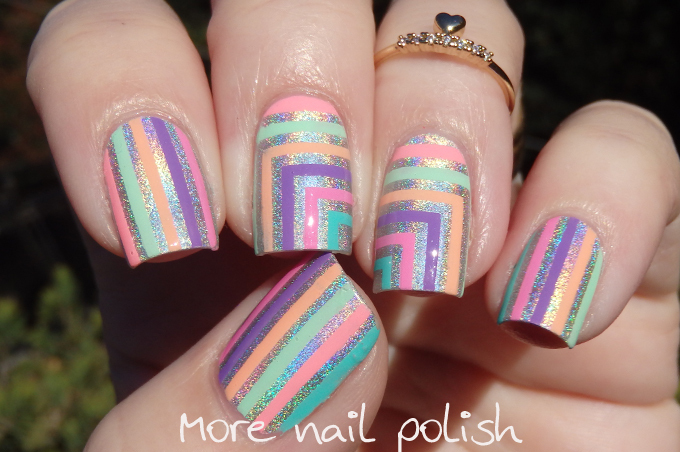 This manicure is too beautiful, I love it! Do you allow me to copy you? 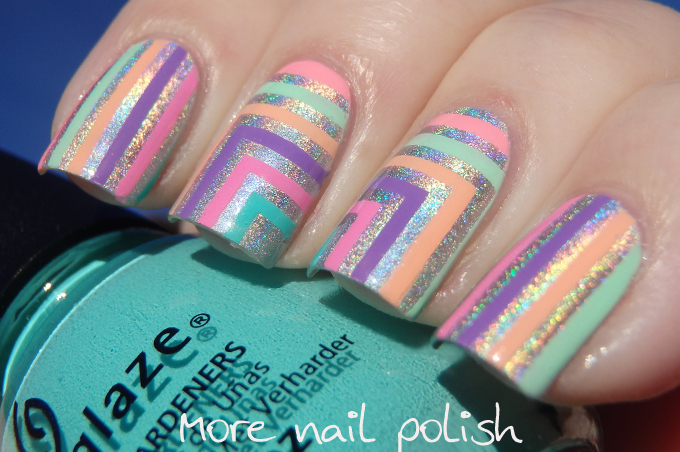 I have the China Glaze polish but not Fnug, I think replacing it with the Color Club Harp on it. That's absolutely gorgeous! And you are right, eucalyptus is lovely and the oil fixes everything! Lovely manicure! Love the pattern and the combination of colors. wow, how do you get the lines so crisp and clear? I used nail vinyls before but I don't manage to have the same results! I tried something different this time using the nail vinyls. I let the polish dry before I pulled the vinyls off. This left me with really sharp lines, but also left the sticky residue - but the Eucalyptus oil fixed that right up. These are SO pretty. It's too bad about the stickiness but if Eucalyptus oil could get rid of it, probably most oils could I'd imagine. I'm glad it didn't get messed up fixing that because these really are stunning!